MostCreepy.com - Baal (/ beɪl / bayl, also spelled Bael, Bael (French), Baell) in the 17th century Goetic occult writing, is one of the seven princes of hell. The name Baal was taken from the god Canaan Baal Mentioned in the Hebrew Bible as the main god of Phoenicians. Devil Baal is in the tradition of Grimoire said to be resemble the shape of a man, cat, frog, or a combination. 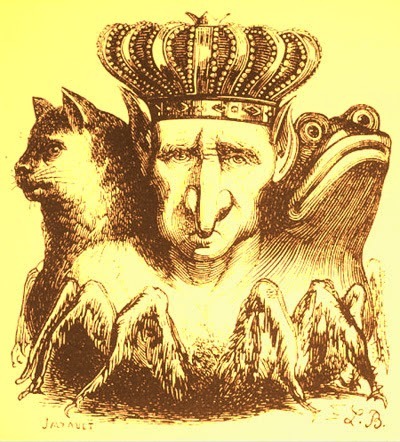 An illustration at Collin de Plancy's 1818 Dictionnaire Infernal book looks strange when placing the heads of three creatures into a set of spider legs. The spreaded figure of the Bael shows as seen in the picture above.